One of the great joys of mosaicmaking is the hand cutting of the tesserae. But sometimes you cannot achieve the shape you are looking for using hand tools. This can be especially true when working with large pieces such as ravenna or pizza cut smalti. We have the solution for you in our line of mosaic power tools. 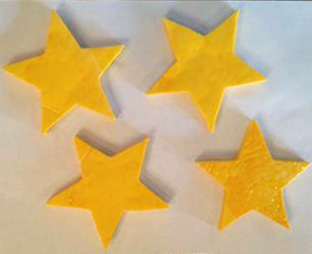 The stars to the right were cut from smalti and are approximately 4" in size from tip to tip. Not ready to make the power tool move? If you have a project that requires a cut shape, contact us. We do custom cutting to your specifications.